I have been a well published and award winning Fantasy author for many years, but always maintained my love of sculpting and turned back to it recently. 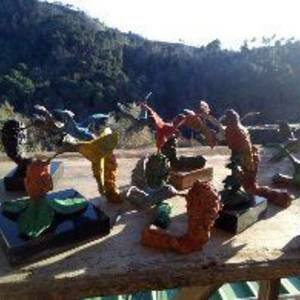 I formed a company called Sculpture Out Of the Box, and began casting especially in bronze, after a hummingbird was admired in Cape Town. I love nature in movement, but also stories and conceptual ideas too, so art will make people think and feel. In terms of Art I am self taught, but don't let that put you off, so was Van Gogh! Westminster School, London, Edinburgh University, British American Drama Academy.